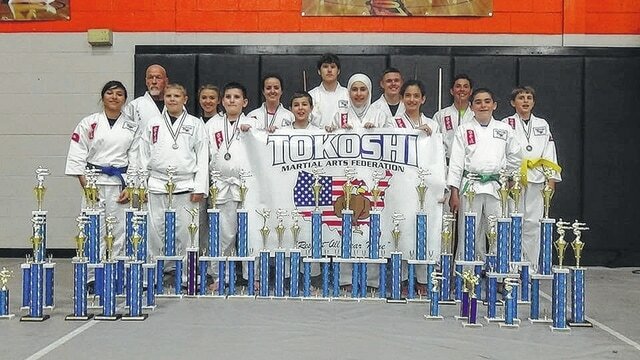 In June, 13 students from the Dogwood Ridge Tokoshi Martial Arts Dojo competed at the Smoky Mountain Classic Karate for Christ World Championship Karate tournament that was held in Pigeon Forge, Tennessee. Pictured front row L-R: Leann Howard who placed first in Weapons Kata, second in Open-Hand Kata and third in Kumite (fighting), Tucker Merritt finished second in Weapons Kata and second in Fighting, Reuben Thayer finished first in Kata and first in Weapons Kata, Alexander Thomas finished second in Fighting, third in Kata and third in Weapons Kata, Rama Soumakieh finished first in Fighting, second in Kata and second in Weapons Kata, Aya Soumakieh finished first in Fighting and second in Kata, and Tate Duncan finished first in Kata, first in Weapons Kata and second in Fighting. Back row L-R: Randy Hiles, instructor, Jessica Howard finished first in Kata, first in Weapons Kata and second im Fighting, Victoria Thomas finished third in Weapons Kata and first in Fighting, Chase Wagner finished second in Kata, second in Weapons Kata and second in Fighting, Tanner Baldridge finished first in Kata, first in Weapons Kata and second in Fighting, Malek Soumakieh finished first in Kata, first in Weapons Kata and first in Fighting and Conner Emnett finished first in Fighting and third in Weapons Kata.